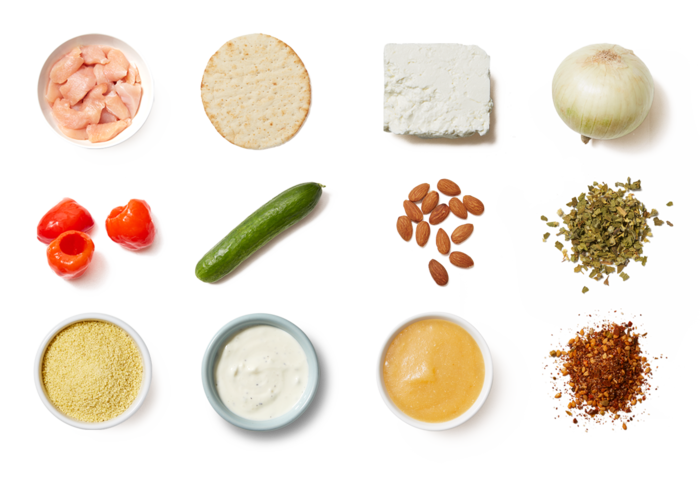 The cooling flavor of cucumber stars two ways in this Mediterranean-style dish: paired with creamy Greek yogurt in the tzatziki we use for our hearty pitas, and sliced fresh cucumbers to toss with fluffy couscous, for crisp, contrasting texture in our side. If you prefer to use an oven to warm the pitas instead of a microwave, preheat the oven to 375°F. Halve, peel, and thinly slice the onion. Pat the chicken dry with paper towels; season with salt and pepper. In a large pan (nonstick, if you have one), heat 1 tablespoon of olive oil on medium-high until hot. Add the seasoned chicken and sliced onion in an even layer; season with salt, pepper, and the za’atar. Cook, without stirring, 3 to 4 minutes, or until browned. 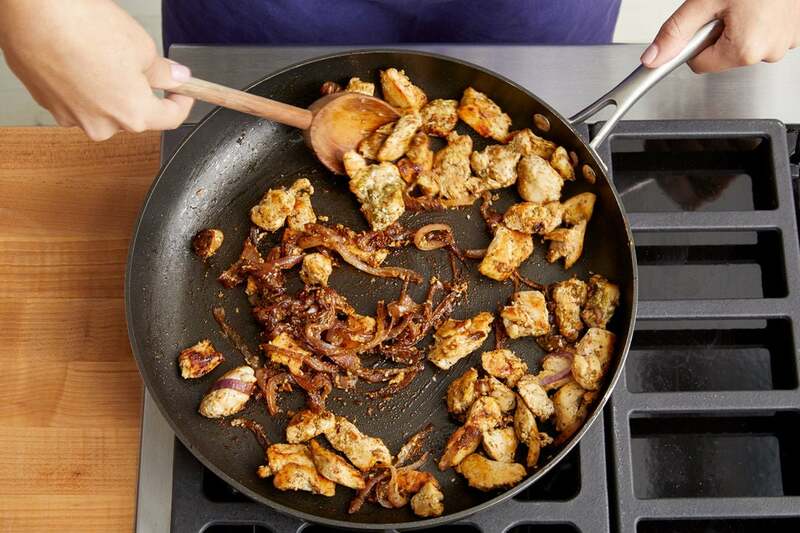 Continue to cook, stirring occasionally, 3 to 4 minutes, or until the onion is softened and the chicken is cooked through. Turn off the heat. While the chicken and onion cook, in a medium pot, combine the couscous and 1 cup of water; season with salt and pepper. Heat to boiling on high. Once boiling, cover and turn off the heat. 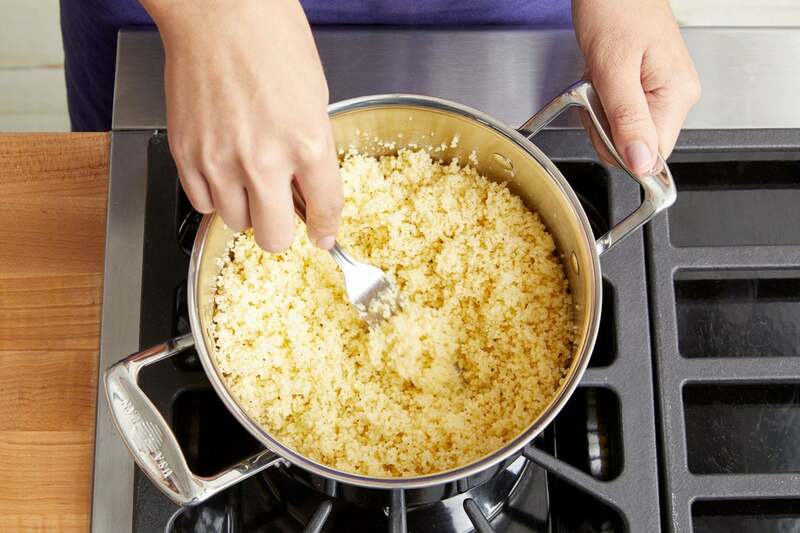 Let stand 6 to 8 minutes, or until the water has been absorbed and the couscous is tender. Fluff with a fork. 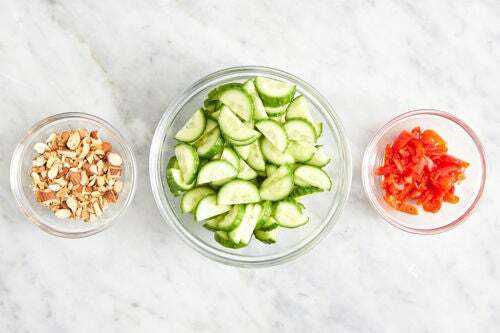 While the couscous cooks, wash and dry the cucumbers; halve lengthwise, then thinly slice crosswise. Roughly chop the almonds. Thinly slice the peppers. If using the microwave, wrap the pitas in a damp paper towel; microwave on high 1 minute, or until heated through and pliable. If using the oven, wrap the pitas in foil and place directly onto an oven rack; warm 7 to 9 minutes, or until heated through and pliable. 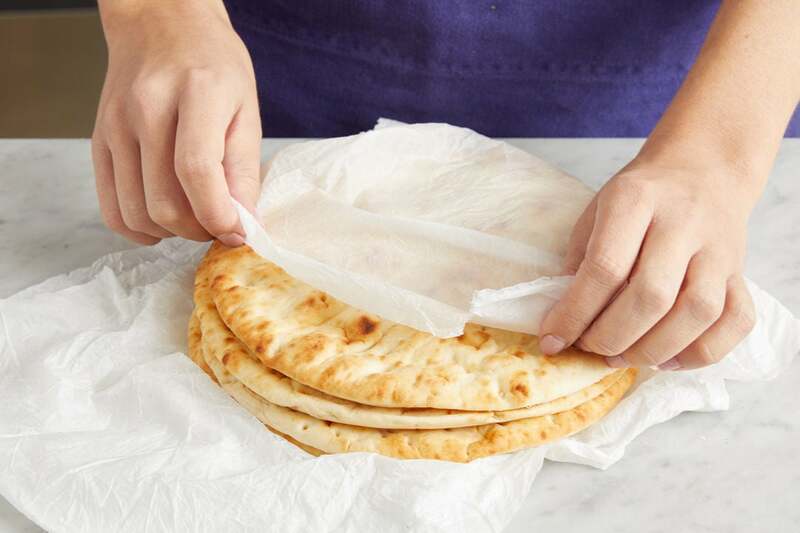 Transfer the warmed pitas to a work surface and carefully unwrap. 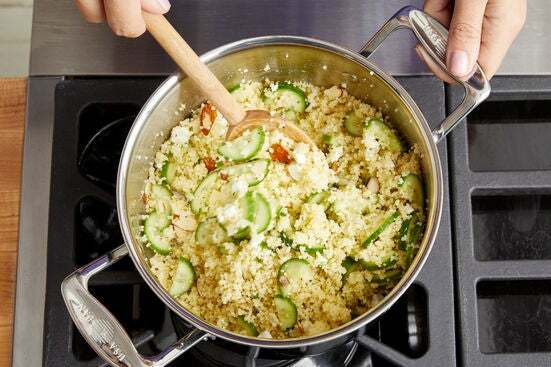 To the pot of cooked couscous, add the sliced cucumbers, chopped almonds, lemon purée, oregano, cheese (crumbling before adding), and 2 tablespoons of olive oil. Season with salt and pepper; stir to combine. Taste, then season with salt and pepper if desired. 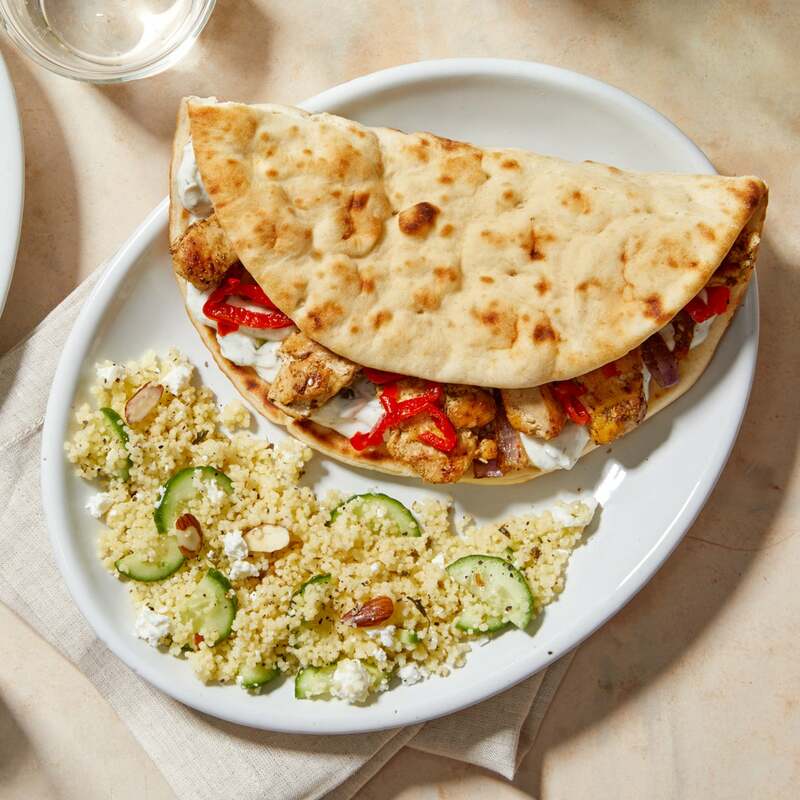 Fill the warmed pitas with the tzatziki, cooked chicken and onion, and sliced peppers. Serve the finished pitas with the finished couscous. Enjoy!